Managing a rental property comes with a number of responsibilities. When you manage a large property or plot of land, however, there are additional aspects to take into consideration. In addition to getting the living area ready for tenants, you also have to take care of landscaping, developing the land, and maintaining the property. While managing so many moving parts may seem overwhelming, you can easily tackle them all if you know what to plan for and when to ask for help. Here are five tips to help you manage your large property. When developing your landscape, your goal is to create an aesthetically-pleasing property to attract prospective tenants. When you have multiple acres of land, the goal switches to making the most of your space and making it easier to maintain. 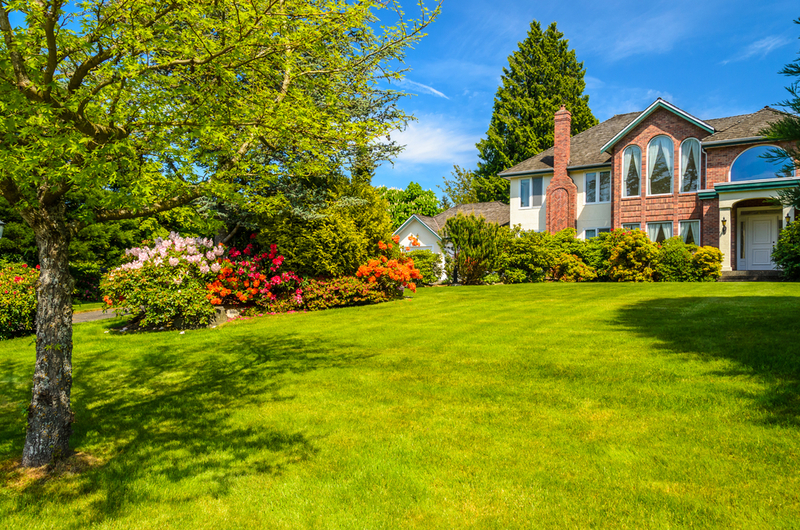 Manage your landscape by creating a blueprint that maps your lawn into sections. You can create different, segmented areas by creating borders with flowers, trees or shrubs. You can also keep the space open, designating each area for something different, like a shed, a play set, a garden, etc. Don’t forget to add trendy décor elements, like a patio section so your tenants can cook and eat outside. Don’t forget fun items like a fire pit or fountain. The best part is that these features benefit both the tenant and you: “Not only do these options offer beautiful and diverse surroundings, but they cut down dramatically on the total amount of mowing, watering, and fertilizing your lawn requires,” says Pete Blackman, of Lawn Master. If you don’t have the budget to create sections initially, designate the areas on the map for building at a later date. The goal is simply to have an idea of what you want to do. Managing a large rental property requires the right tools. Instead of wasting your time and energy using a traditional lawn mower, consider buying a tractor. Despite being an expensive investment upfront, you’ll be happy when you discover your tractor’s versatility. In addition to general mowing, you can use your tractor to spread fertilizer, clear bushes, plough, till and maintain your landscape. They key is finding a tractor that has more horsepower than you think you’ll need: “If you are going to make a mistake, always make the mistake of buying too much horsepower," says William C. Nelson III, President, Nelson Tractor Company. This allows you scale your projects, taking on more challenging tasks that require greater horsepower without buying a new tractor. Part of being a good property manager is delegation, and doing so when you know a project exceeds your expertise. While you can take care of most landscaping needs, hire a contractor for electrical work, plumbing and renovations. Your rental property is an investment so you should do what you can to protect it. A wireless home security system is a low-budget way to secure a large property that’s otherwise challenging to keep safe. With so much to maintain, inside and outside your rental, you can reduce stress by creating and sticking to a consistent maintenance schedule. Schedule regular checkups for plumbing, electricity, heating and air, landscape and lawn care, etc. Even if you’re doing some of these tasks yourself, schedule them ahead of time. Being proactive about maintenance can help you save money on costly repairs because you can solve problems before they escalate. It will also ensure that you don’t forget something important—with a large piece of property, that’s easy to do. A proactive approach will help to reduce the stress associated with managing large properties. In the end, you’ll have happy renters and be a more effective property manager.